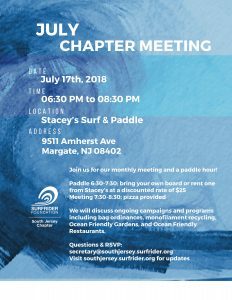 Please join us for our July Chapter MeetingOur July meeting will occur on July 17th and will include a paddle followed by our meeting. Bring your own board or rent one for the discounted price of $25. Pizza will also be provided. We will discuss our ongoing campaigns and programs including bag ordinances, monofilament recycling, Ocean Friendly Gardens, and Ocean Friendly Restaurants.